What Does an Overheated Engine Mean? If you’ve ever had to hop into a car parked in the sun on a hot July afternoon, you know how much you depend on automotive air conditioning. The blistering heat – even here in Colorado where humidity levels remain relatively low – can be unbearable. If your car has air conditioning, you probably take it for granted. If it doesn’t, you definitely notice. Learn more about how car air conditioning works and why you should occasionally bring your car to Scott’s Fort Collins Auto & Repair for a recharge. Car A/C has been around longer than you might think. It was first invented in 1939 by Packard, and the following year, this car company became the first to offer this feature. By 1969, more than half of all new cars came with air conditioning. Plus, aftermarket A/Cs were available if penny-pinching car buyers skipped the add-on in January only to regret their decision come June. For decades, the same refrigerant was used in car air conditioning. Known as R-12 or Freon, it was later determined that this refrigerant damages the ozone layer. It was phased out and eventually completely banned in 1996 in favor of R-134a. Now, any older cars still using Freon must be retrofitted to work with the newer, safer refrigerant. Today, automotive air conditioning is universal with 99 percent of cars manufactured after 2010 featuring it. However, just because a car comes equipped with A/C doesn’t mean it’s guaranteed to work flawlessly for the life of the vehicle. Sometimes recharging is necessary restore the ideal amount of refrigerant in the system. 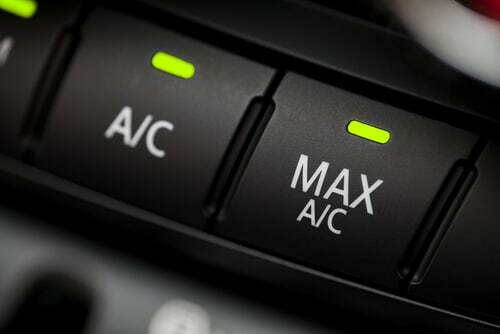 As with any form of air conditioning, car A/C units rely on several components to work in tandem for proper operation. Compressor: Refrigerant enters the compressor as a low-pressure gas. A belt attached to the engine’s crankshaft comes to life and pressurizes the gaseous refrigerant. Condenser: The refrigerant exits the compressor as a hot, high-pressure gas. The condenser’s job is to remove heat from the refrigerant, acting much the same as your car’s radiator. As the refrigerant cools, it condenses back into a liquid state. Receiver-dryer: By now, the refrigerant is a high-pressure liquid. It passes through a little reservoir called a receiver-dryer, which contains small granules that attract water called desiccants. This process is important to remove water that may have entered the system so ice crystals don’t form within the refrigerant. Thermal Expansion Valve (TXV): Upon entering the TXV, the high-pressure liquid refrigerant expands, lowering the pressure and cooling it down. This valve senses pressure and air conditioning demand, and regulates refrigerant flow as needed. Evaporator: The cold, low-pressure liquid refrigerant now flows to the evaporator, the only component of automotive air conditioning located in the cabin rather than the engine compartment. The evaporator looks like a radiator, but it has the opposite job of absorbing heat rather than dispelling it. The heat in the cabin is enough to make the liquid refrigerant boil and turn back into a gas, a process that allows it to absorb a lot of heat. The now hot, low-pressure refrigerant circulates out of the evaporator and back to the compressor, taking heat from the cabin air with it. Blower: A fan blows cabin air over the evaporator where newly cooled air is waiting to circulate into the passenger compartment. As the fan blows, moisture from the air condenses on the cold exterior of the evaporator, which effectively removes humidity from the air as it cools. When Does a Car Air Conditioner Need to be Recharged? Like the oil in your car, refrigerant circulates through the system long-term rather than being used up like gasoline. Still, the refrigerant level may eventually drop below the ideal amount, just as oil levels gradually decline. Low refrigerant causes the A/C to lose its cooling ability. This is where recharging comes in. The process involves safely and properly draining old refrigerant and adding new refrigerant in a precise amount. If the refrigerant is low because of a leak, it’s important to have this fixed so your A/C works well all summer long. Think your car air conditioner could use a recharge? Stop by Scott’s Fort Collins Auto & Repair for professional service. You can also schedule an appointment online or call ahead at (970) 682-4202.